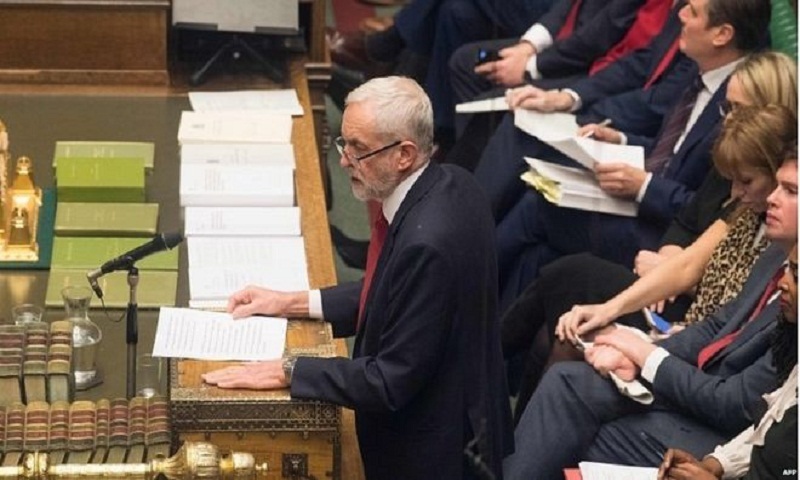 The Labour leader will tell activists in Yorkshire that only a government with a "renewed mandate" will get public support for a withdrawal deal. His party will oppose Theresa May's deal next week, and push for a vote of no confidence if it is rejected by MPs. The PM is considering trying to win over some Labour MPs to the deal by offering extra protection to workers. Mrs May, who will host Japanese Prime Minister Shinzo Abe for talks at Downing Street on Thursday, is also continuing efforts to win over sceptical Conservative MPs ahead of Tuesday's vote. However, Arlene Foster, leader of Northern Ireland's DUP which has helped the government win votes since June 2017, has warned the PM her deal is "already dead". In a sign that the party has not been swayed by the government's promise to give the Northern Ireland Assembly a veto over any new EU regulations introduced under the terms of the proposed backstop arrangement, she accused Mrs May of "wasting time". The government has lost two Brexit votes in two days. The first defeat limits the government's financial powers in the event of a no-deal departure. The second forces the PM to announce new plans within three days if her deal fails in the Commons. No 10 is now considering accepting an amendment tabled by Leave-supporting Labour backbencher John Mann that would provide for additional safeguards on workers rights and environmental protections.